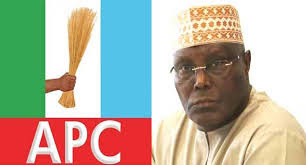 The ruling All Progressives Congress, on Saturday, said it was not bothered by the petition filed by the presidential candidate of the Peoples Democratic Party, Alhaji Atiku Abubakar, against President Muhammadu Buhari�s re-election. It described Atiku�s petition, currently before the Election Petitions Tribunal, as absurd. The party�s National Publicity Secretary, Lanre Issa-Onilu, said this in an interview with journalists in Abuja. He said, �Why should anyone bother about such fallacious allegations contained in Alhaji Atiku�s affidavit? That is a theatre of the absurd. �Well, there is something to laugh about in its absurdity. Is it the purported figures the PDP claimed to have fetched from INEC server? Is it the figures he awarded himself? �To be fair to him, he extended his generosity to us in the APC by awarding extra one million plus votes to our over 15 million votes. He said, �As a party in the majority in the two chambers, the APC does not require the support of the PDP to elect the Senate President, Speaker and the other principal officers. He added, �They are in the National Assembly to help the ruling party deliver on its mandate. APC lawmakers are the legislative arm of the APC. �We have the majority members in both the Senate and House of Representatives. They automatically produce, and not elect, the leaders of the two chambers. �The rule allows for a simple majority and the APC has that already. You may need to ask those who are posting unfounded opinions about this issue when did they see the Democrats and Republicans in the United States� congress conducting elections as a unit to choose leaders? �If the democrats are in the majority in the House of Representatives in the US, they automatically produce the Speaker and other leadership positions that belong to the majority party. �The Republicans will also produce leaders for the positions that belong to the minority positions. If the situation were reversed, then the leadership positions would be reversed in like manner. He said, �Under the able leadership of our President, we have already turned the corner.